Really fine course with lots of shade. Wilson Creek runs throughout. 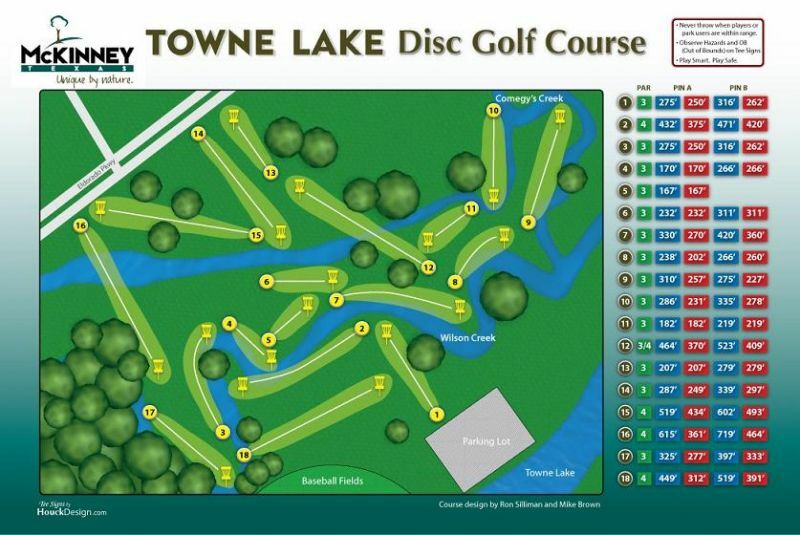 You may want a floating disc as Towne Lake usually welcomes you by taking a disc into the creek. The creek is mostly narrow - usually fairly easy to retrieve your disc. Solid trails, benches and trash cans throughout and good signage. Most holes two pin positions. I-75 north from Dallas; Eldorado Pky exit. Go north on service road to a right on Park View Ave. Take a right at the Wilson Creek Pky., 0.25 mile, turn into baseball field parking lot. 1st hole in tree at south end of the lot. One of the best courses around. Very difficult, but will make you a better player for it. The championship tees are extreme, but give you confidence for anything that you come up against. If your new to the game go across the street and have fun at Alex Clark, but if you want a run for your money and to test your skill Towne Lake is where to Tee off. My first 5 rating. Great tees and most holes have a choice of harder one. Two pin positions on all holes as well. Great course to work on control. Most shots require you to go to the right, around trees, keep it low. 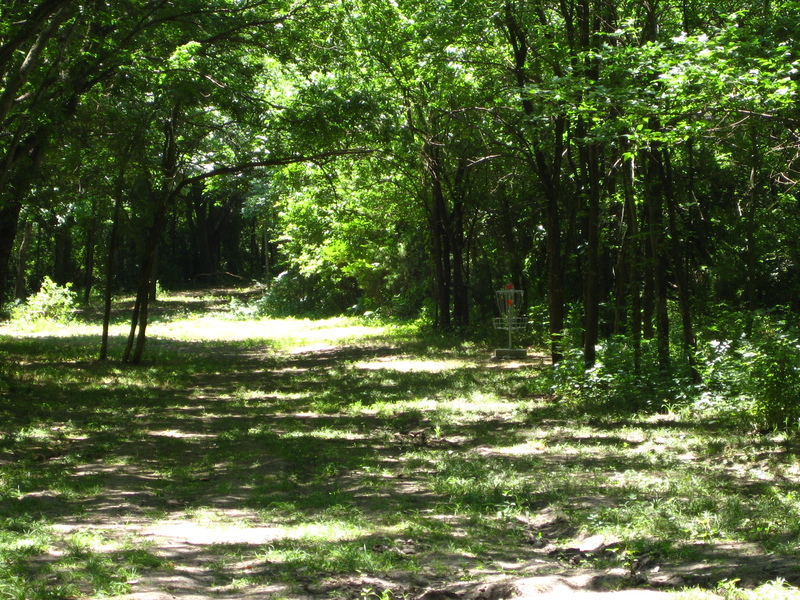 Hole #8 is very tempting to go after. Its just left of a 30ft drop into a creek. Difficult and fun course. Couple of holes that are over 550ft. Didn't have a problem with mosquitos, but its pretty dry. 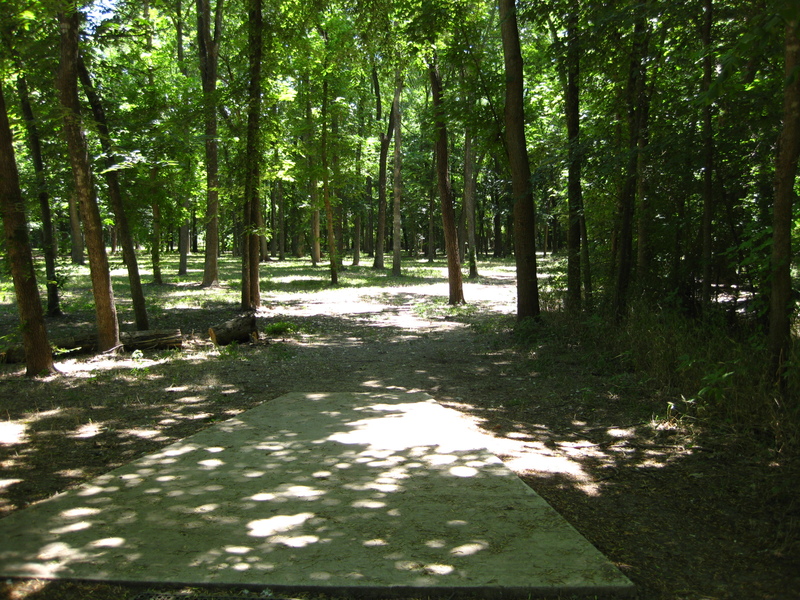 Great course, but I wouldn't suggest throwing DX discs, because you will hit some trees. Best course I have played in this area. I lost one disc trying to throw high over the bend in the creek and I snagged a tree. As tempting as it may be keep all throws lows and take the extra shot. The Mosquitoes are horrible and I have yet to run into a snake but I am sure they are out there. Coolest part about the course has nothing to do with the holes because each tee box has a brush designed to remove mud from your shoes. Very fun and challenging course. This course is challenging!! and he said it right, play it low and slow, because this course can easily snag a few you thought would be ok until a richochet sends it sailing back 30 ft the other direction into a creek. My friend lost 3 discs in one day in my preparation for my 1st tournament at this course. It is a woozie, it will challenge you, and you will be better for it. The tee boxes, signs and maintenance are the best i've ever seen. Great course to really hone your skills, and to lose a disc or two on. 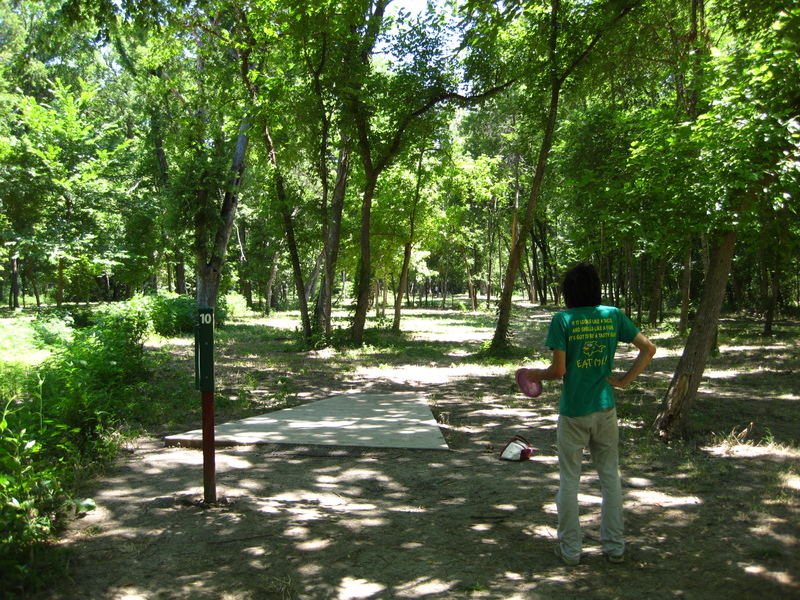 This course will, I repeat, will eat your disc if you're not careful. Play it slow and low, that is the tempo, and this course will quickly become an all time favorite. I like to play at Alex C. Memorial first get in a good warm-up course, before tackling Town Lake.